I'm new to this whole blogging thing and though I'm enjoying reading other people's blogs I'm very uncertain about how much I actually want to write my own. Still, now that I've signed up I really ought to have a play with it, try uploading some pictures etc and see how it goes. But I can't help thinking it would be just one more thing to add to my 'to-do' list and do I really want that! 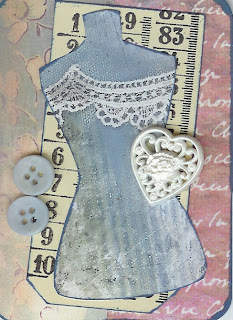 So now I've managed to upload a picture and this is an ATC I made in response to Lisa Vollrath's Go Make Something Monday. She provided templates for both women and men's torsos in different sizes to use to make a tag. I decided not to make a tag but to stick it on an ATC and here it is.